We let of lots of Balloons in remembrance of those we have lost to suicide and to celebrate the hope we have for the future at the Waterside on the 12th September. 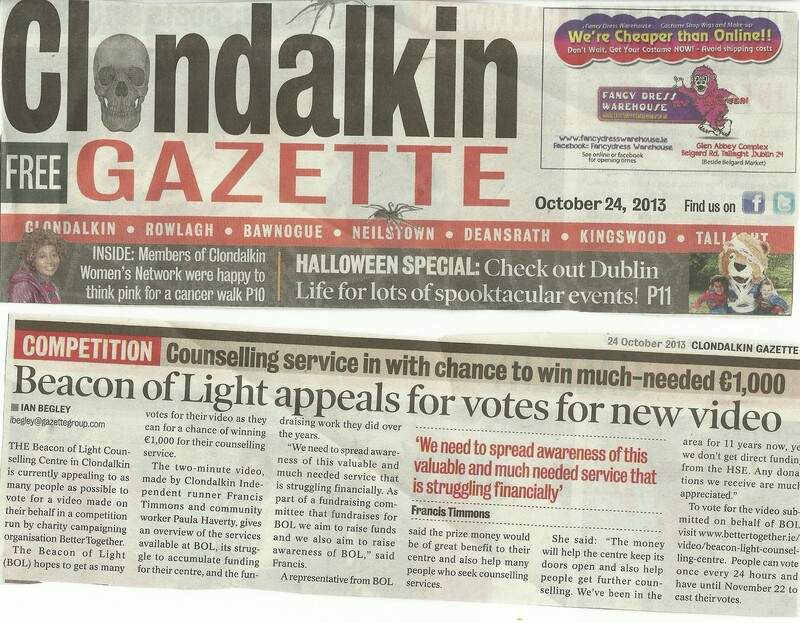 The event also highlights the much needed and used Beacon of Light Counselling service. The Centre is always in need of funds. Cllr Francis Timmons (Independent) said it was a touching display of remembrance and a chance to Highlight the Beacon of Light. We raised €400 after in a raffle for the Beacon of Light. He said the celebration and remembrance is now in its third year and is a popular event. suffering with depression. If you would like to have a photo of your loved one shared on the wall or a short message/poem please email it for the attention of Angie McEvoy to mcevoy_7@hotmail.com or you can pm it through their facebook page. Voting for Better together finishes tomorrow 22nd Nov @ 5pm , Please vote @ http://www.bettertogether.ie/video/beacon-light-counselling-centre I am so happy that the video made by Paula Haverty is in first place I am glad that I submitted it for the Beacon of Light I hope the Beacon gets a much needed €1,000. Thanks to all my family and Friends for voting. please vote and share for one last time. Vote until 22nd Nov. each day http://www.bettertogether.ie/video/beacon-light-counselling-centre share with family and friends. 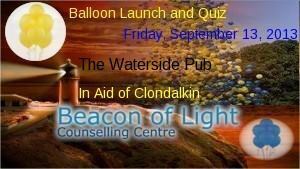 €1,070 raised for Beacon Of Light so far thanks to everyone who supported such a great cause. Thanks to Eddie Kinsella for taking the Pictures , ReelStyle Irishdancetroupe for brilliant entertainment , Bernard Forester for helping mark the quiz answers , The Waterside Bar Clondalkin for there help and support , DJ Dermo for asking the Questions , Caroline Anne Corcoran for writing the questions , Darren Lamont for printing posters and quiz materials and everyone who bought tickets and did the quiz. Also Brian McElroy who donated €100- for the quiz 1 st prize which the winners donated back to the fund. 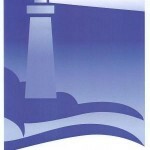 The Beacon of Light counselling service is based in Collinstown Close, Neilstown, Clondalkin. In 2010 they lost a major grant that has left them in serious financial difficulty. The Beacon of Light fundraising committee was set up in 2013 to aim to raise funds to aid the work of Beacon of Light Counselling Centre. They currently have a waiting list of 45 people and 14 of these are Children. There is normally 100-120 counselling sessions provided weekly. The Beacon of Light counsellors are mainly volunteers, the reception staff are JI and CE Workers ,without their assistance Beacon of Light Counselling Centre would have to close this much needed service. also please pass this email on to Friends and Family or/and share on Facebook. They currently have a waiting list of 45 people and 14 of these are Children. There is normally 100-120 counselling sessions provided weekly. The Beacon of Light counsellors are mainly volunteers, the reception staff are JI and CE Workers without their assistance Beacon of Light Counselling Centre would have to close this much needed service. Beacon of Light supports people through Individual Counseling, Family Support, Suicide prevention, Workshops and Counseling for children from 7 years and their parents. Beacon of Light Counseling Centre offers counseling to those who need it, at a cost appropriate to the person’s current circumstances. Issues and feelings are explored in a safe, confidential, non-judgmental way. This enables those seeing help to explore and process feelings and look at options in order to choose a positive way forward. The counselor may offer options for other support services, but you make all the decisions. 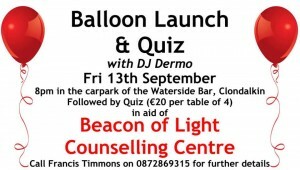 To help raise funds for Beacon of Light Counselling Centre, we are holding a Balloon Launch and Table Quiz – Raffle on 13th September in the Waterside Pub Clondalkin with DJ Dermo to raise vital funds. The Balloon Launch is at 8pm in the Waterside carpark and this will be followed by quiz and raffle. 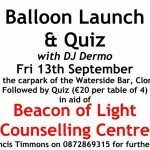 Beacon of Light – Balloon launch , Quiz & Raffle. 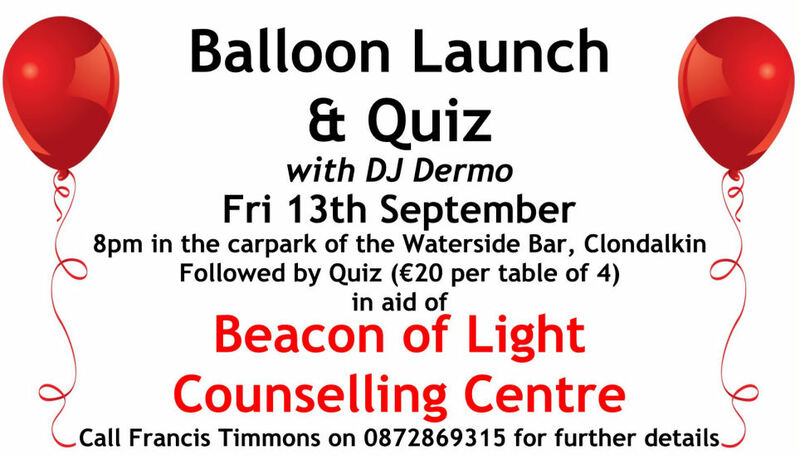 The Beacon of Light Fundraising committee will hold a Balloon launch at 8pm in the Waterside Car park in memory all those who lost there life to suicide on Friday 13th September , after the balloon launch we will hold a quiz and raffle for the Beacon of Light. The evening will aim to raise funds for the Beacon of Light and to raise the profile of the Beacon of Light in the area. The Beacon of Light Counselling Centre (Telephone 01-4578700) supports people through Counselling, Family Support, Suicide help, Workshops and Counselling for children from 7 years and their parents. Beacon of Light Counseling Centre is a community based project which provides high quality, accessible and affordable professional counselling and training workshops. This service provides support and positive intervention to assist individuals, families and groups guiding them toward positive relationships with self, others, the community and the environment. Please contact Francis Timmons Beacon of Light committee member– 087 286 9315 or email info@francistimmons.com if you can help in any way or require any further information.